Today, the Bureau of Land Management (BLM) issuing a one-year delay of the BLM methane regulations, pushing aside 175,000 public comments, a vast majority of westerners, and the public interest of New Mexico. Read the full press release below, learn more about methane rule here. Today, the Trump administration is delaying the Bureau of Land Management’s (BLM) Methane and Waste Prevention Rule for one year – despite over 175,000 comments in opposition. The BLM methane rule was put in place to protect clean air, public health, and taxpayer money in communities like those under the Four Corners Methane Hotspot from the unnecessary waste of natural gas on public and tribal lands. The rule was finalized under the Obama Administration after the BLM extensively heard from and met with affected communities across the nation. 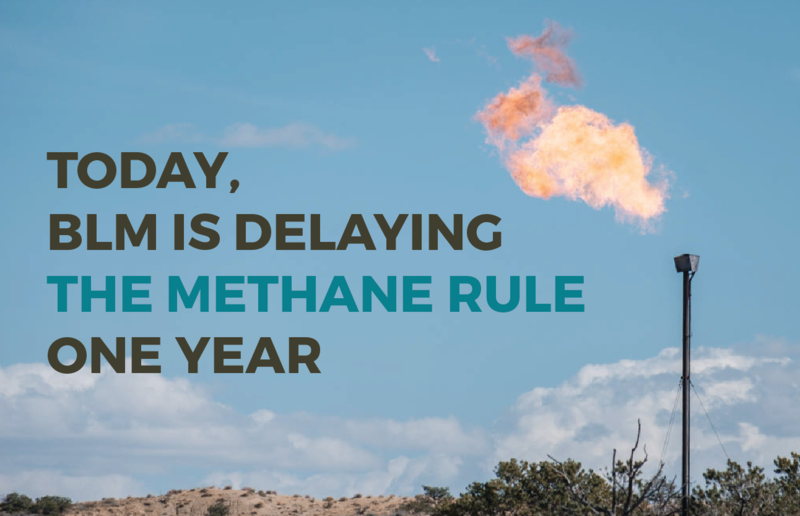 Even though a majority of citizens support efforts to cut methane waste and pollution, the BLM’s one-year delay buys the Trump administration time to revisit and weaken the rule. 100 protestors in Durango, Colorado in November showed that support for the BLM methane rule refuses to diminish in the Four Corners, despite never ending attacks from the oil and gas industry and those aiding them. Groups like SJCA and our partners will continue to defend the rule against any revisions. The methane rule survived a Congressional Review Act attack in the U.S. Senate this spring. Then, this summer, the U.S. District Court for the Northern District of California ruled against the Trump Administration’s first attempt to delay the rule. “Today, the BLM proved that they’re not interested the economic or physical health of the people they’re supposed to serve,” said Emily Bowie, Campaign Organizer for the San Juan Citizens Alliance, “By circumventing this important protection, they’ve ensured that at least $182 million worth of New Mexico’s natural gas will be wasted into the atmosphere. New Mexicans should be enraged. This unnecessary wastefulness will cost the state $27 million in lost revenues and royalties that could have been saved for roads and schools” (Source: EDF Report). The whole country is being ruined and wasted by the trump idiots , and they don’t seem to give a damn. We can only hope there is something left to hold on to come the 18 elections!!! PLEASE vote BLUE to save this wonderful country while we can! !